Snippets of Jack: "For some reason, I'm inclined to indulge you"
"For some reason, I'm inclined to indulge you"
In case you haven't noticed, Jack sparrow loves the sea, and loves being a captain. He is also one pretty awesome pirate captain and I'd sail under him any day. But being a captain is something he gained on his own. The one and only ship he ever has captained is the Black Pearl, but when he is first made captain she was neither a pirate ship, nor owned by him, nor even called the Black Pearl. She was called the Wicked Wench. How she later becomes a pirate ship called the Pearl is a story for another day, and don't worry, you'll hear it soon enough. But let's look back to when Jack first gains his beloved title. He was 25 years old and working as a merchant sailor for the East India Trading Company (pretty surprising, eh?). He becomes the first mate on board the Fair Wind, second in command under Captain Nathaniel Bainbridge. But he's not the most responsible captain, and he drinks and sleeps a lot so basically Jack runs the ship. But he doesn't have the title as captain yet. That is, until the Fair Wind runs into a pirate ship, the Venganza, captained by Jack's good lady friend from the past, Lady Esmeralda Maria Consuela Anna de Sevilla, aka Dona Pirata. The two captains sword fight a bit (no surprise there) and Bainbridge dies. The Fair Wind sets sail again with most of their cargo and under a new command: Jack's command. Jack sails the ship out of the Spanish Main to London and then onto the Fair Wind's port of registry in Calabar. Upon their arrival Jack Sparrow and Robby Greene, the second mate and good friend of Jack's, report to the new director of West African Imports and Exports for the East India Trading Company, who so happens to be Cutler Beckett. As the first and second mate walk into the room, Beckett, being the upper class neat freak, can't help but notice the "whiff of salt air, tar, and none-too-clean human". And once he gets past the smell, he takes a moment to examine how they look. Beckett takes note of Jack's "regular features . . . a good chin. Dark, eyes, steady and clear. One might almost call him . . . good-looking. Except for the dirt, of course." Always remember that dirt. "Nothing slow about this one. Confident . . . even a bit cocky? Still, there's that smile." So in some ways Beckett seems to like Jack. Doing his job, Beckett asks about the voyage: the death of the captain, the pirates, and the stolen cargo. Jack and Robby explain the Jack parleyed with the captain and convinced her not to take all the cargo. They turner in the logbook for Beckett to examine. As they leave, Beckett's final decision is that he's "definitely cocky" and "might need taking down a peg or two. . ." But nevertheless Beckett is impressed by Jack's charming features (who isn't?) and how he was able to save most of the E.I.T.C. rum. Later that evening, Beckett goes through the logbook but at the end of the written section, he finds that a page had been torn out but there are indentations of words on the next page. So Beckett decides to explore it by taking a pencil and lightly coloring over the indentations to reveal the hidden words. And what does he find? Super deep dark secrets? Not really because it's no secret that Jack wants desperately to be a captain. 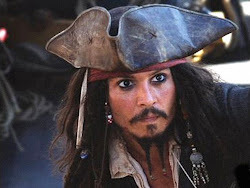 Jack had written "Captain Jack Sparrow" again and again in many different styles. Beckett finds this as humorous as I do: "Jack, Jack, Jack . . . I've caught you, Jack. I know what you want." So the next day Beckett calls Jack into his office again and the fun begins! Beckett: "I've come to the conclusion that the EITC owes you rather a debt, Mr. Sparrow.You handled an uncomfortable, inherently dangerous situation with logic, and personal . . . charm . . . it seems. And thus saved the company a considerable sum of money." But wait, it gets better! "Generally, when EITC employees save the company money, I award them a nice bonus. Say ten pounds." Jack likes the sound of this but likes what comes after it even better. "However, I suspect there are things you would much prefer to have rather than a monetary bonus, if I judge you character correctly. So . . . how would a promotion to captain suit you, as well as a vessel to command?" And there it is! Beckett asks Jack to captain the Marlin which Jack of course accepts. But there's a catch. Beckett: "Her cargo area needs to be refitted to handle her projected cargo. The shipwrights tell me she'll be able to haul nearly three hundred. With cargo that size, you're sure to have at least two hundred arrive in Barbados alive and ready for sale." The slave trade. That's what Beckett wants to pull Jack into. Jack: "No." This doesn't sit well with Beckett: "No? Jack: "I'm sorry, Mr. Beckett. I'm not your man. I'll haul any cargo you assign me, even powder, dangerous as that may be. But I won't transport slaves." That's pretty bold. Beckett, who can't take a no, yet alone from his "subordinates" but Jack sticks to his opinion and makes Beckett deal with it. Jack: "Thank you, Mr. Beckett, for the offer. I'll just stay aboard Fair Wind, sir, as first mate, if that's agreeable to you." Beckett is actually sad to see Jack get up and walk out of the room. "This man is actually going to turn me down. I can't let him go. He has too much potential. " So Beckett makes a life changing decision right there and then: "Just a moment. Come back, Sparrow. Perhaps we can make a different . . . arrangement." I guess it pays off to stick to what you believe is right. Beckett: "I mean that for some reason, I'm inclined to indulge you, Sparrow. I have another ship. It's one I actually own. It's an older ship. The shipwrights have told me that converting her hold to haul slave would be expensive, and rather time-consuming, so I bought her for hauling other cargo's. She's called the Wicked Wench. Would you like to sail her for me, Captain Sparrow?" And then the two business partners share a drink and toast the the Wicked Wench and the adventures to come!